Whether you're prepping a dozen veggies for authentic Asian stir-fry or carving up a chicken to go with your homemade dumplings, your cutting board should be durable and attractive. Do away with hard plastic and glass boards that dull knives and harbor bacteria. 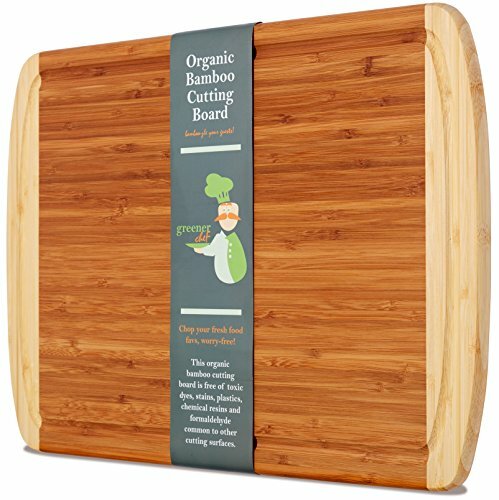 It's time to step up to a 100% organic cutting board made from natural bamboo that lasts for years and looks amazing. ✔Constructed entirely from organic bamboo with no stains, finishes or pesticides, this cutting board will quickly find its way onto your list of must-have kitchen tools. ✔Elegant design is perfect for serving cooked meats without making a mess, thanks to the drip groove. ✔Flip the board to the smooth side for a dual-purpose serving tray or platter. ✔Extra-large size makes cooking easier, whether you're mincing garlic or carving a roast. ✔To keep your board in tip-top shape, be sure to get a bottle of GREENER CHEF'S CUTTING BOARD OIL SPRAY to beautify and prolong the life of your board. ✔Naturally anti-microbial bamboo makes the ideal choice for kitchen safety. ✔Never dulls your knives even after thousands of hours of chopping meats or vegetables. ✔Buy with confidence thanks to our ★100% no-questions-asked, money-back guarantee★. ★Greener Chef is a teeny-tiny family business made up of a whole-foods nutritionist (me, Laura) and her superhero hubby (Brent). We share your passion for natural food + living, and thank you for supporting our cleaner, greener products and our family!